D. J. Squire & Co. Ltd (Squire’s) and Wheelhouse Warehousing Ltd has announced the purchase of Frensham Garden Centre by Squire’s from Wheelhouse. The purchase was completed on 1 August 2018. 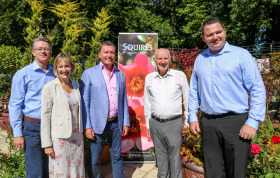 Under the terms of the agreement, which was signed in early July, Squire’s will take over all the assets and business of the Garden Centre, and the Frensham team will become part of Squire’s. Financial terms of the transaction were not announced. Frensham Garden Centre is a well-known and successful garden centre located in Frensham, to the south of Farnham. David Wheelhouse commented: “I am happy to see the business that I have built up over many years, and the hard-working and loyal team members, become part of Squire’s. I have known the Squire family for many years and am confident that they will build on the firm foundations that we have created at Frensham Garden Centre”. Squire’s has an ongoing roll-out of upgrades across its centres, from revamped cafes to complete refits, as seen at its Woking centre, which had a makeover and significant extension earlier this year.